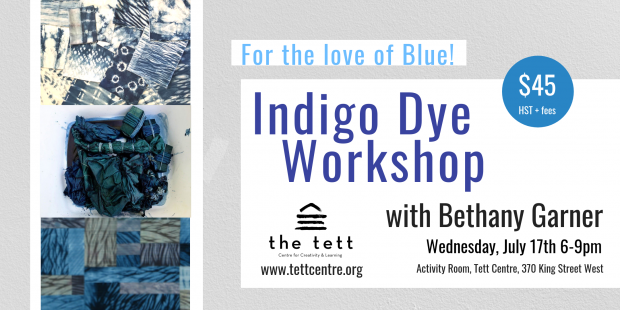 In this 3 hour workshop discover the magic of indigo dyeing with Bethany Garner! This class is designed to share multiple techniques that delight and stimulate creativity and result in a beautiful collection of hand dyed fabric samples for you to work with after class. Learn about fabric preparation, stitching, clamping and wrapping techniques. Enjoy instructor led demonstrations and free time to create! The Workshop focuses in on ‘easy to use at home’, studio bucket dyeing methods that everyone can use and take away for further exploration as they develop their new skills. * Dye materials included in class fee. * A comprehensive workshop handout folder is provided. * 1 M. of 100% Cotton, prepared for dyeing Sample Cloth included. * Please bring a large container to take home wet papers/fabrics. * Students are welcome to bring their own fabrics/yarns/threads. Bethany travels and teaches for Quilt Guilds, shops and women's groups by invitation. She is the Owner and Managing Co-ordinator for the FIBREWORKS KINGSTON Weekend Workshops Series which has brought the very best of the best Fibre Arts Educators to Canada since 1979.